Students have repeatedly appealed to the dean of the Law School and John Sexton for Strauss to be removed, but to no avail. 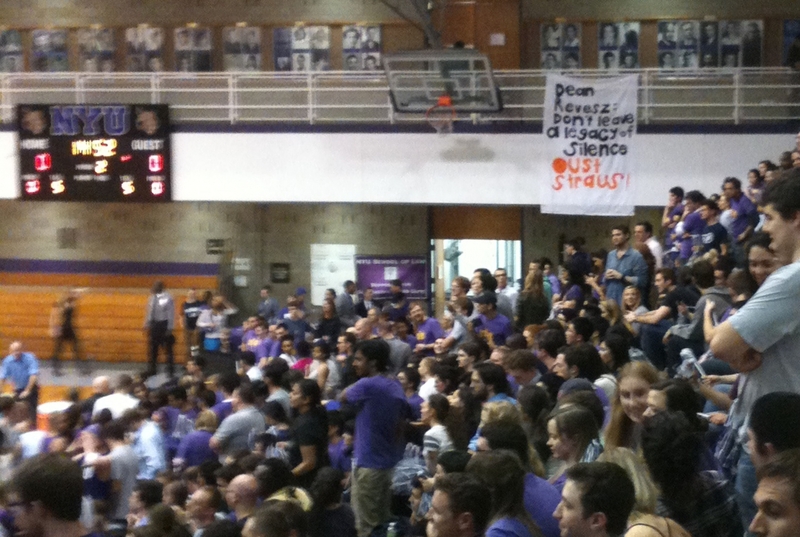 At last week's Deans Cup Basketball game between NYU Law School and Columbia Law School members of the Student Labor Action Movement or S.L.A.M. unfurled two banners in protest of Law School Trustee Daniel Strauss. He has sat on the Law School's Board of Trustees since 1998 and endows the University with an ongoing gift of $1.25 million a year to run the Straus Institute for the Advanced Study of Law & Justice, which is located in a townhouse at 22 Washington Square North. The students also handed out popcorn with flyers attached asking NYU to cut ties with Strauss. Strauss owns both the CareOne and Healthbridge management companies which own dozens of nursing homes in New Jersey, Connecticut and Pennsylvania. S.L.A.M. claimed in an April 11 press release that Strauss' companies had "illegally intimidated, fired, and locked out nursing home workers in their facilities in New Jersey and Connecticut". Paul PastorePaul Pastore is an on-campus staff writer at NYULocal.com.